Ananda Bhaskar Rapolu was denied a Congress ticket from Palakurthy constituency in Warrangal district during the Assembly polls in 2018. Ananda Bhaskar Rapolu had served in the Congress for 25 years. 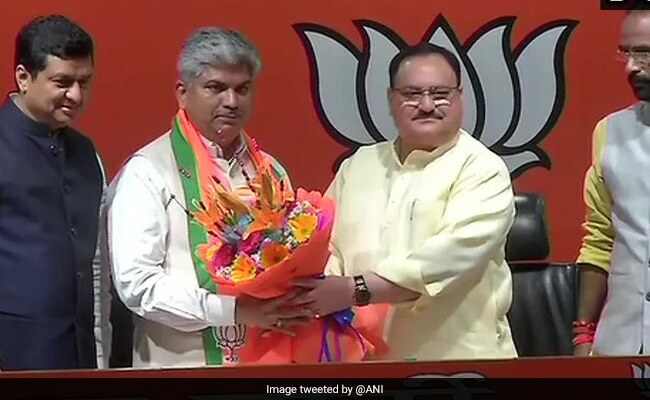 Former Rajya Sabha member from Telangana Ananda Bhaskar Rapolu on Thursday joined the Bharatiya Janata Party (BJP) in New Delhi in the presence of Union Minister JP Nadda. Mr Rapolu, who had served in the Congress for 25 years, had resigned from the primary membership of the Congress in March. He was elected to the Rajya Sabha in 2012. Mr Rapolu was denied a Congress ticket from Palakurthy constituency in Warrangal district during the Assembly polls in 2018. Telangana will vote in a single phase for all 17 Lok Sabha seats on April 11. Results will be declared on May 23.